OK, so we all know the right answer is to repeal the 2008 Climate Change Act and/or remember that the soi-disant 'legally binding target" for CO2 emissions is not what the greenies would have us believe. The first is self-explanatory, and Osborne's recent rhetoric (OK, recent drivelling) has been feeling towards this really obvious approach. It really shouldn't be impossible to sell this politically; we could all come up with appropriate slogans. MACC may need more explanation. The Marginal Abatement Cost Curve is a very simple concept. Rank CO2 abatement measures according to how much the cost per unit abated by that method, from least to most expensive. The cheapest actually don't cost anything, of course, they are profitable to carry out - without subsidy - and hence "self-financing" (the bars below the X-axis on the left hand end, mostly efficiency measures). So an MAC curve looks like this. Each bar represents a different abatement method. The width of each bar shows the quantity of abatement that each method could yield. An MACC will apply to a given country or sector, because each one will differ in the details of its energy-economy, and of the abatement-potential of the various measures. (If, for example, in a particular country all light bulbs have already been switched to energy-saving, that abatement technique no longer has any potential there). 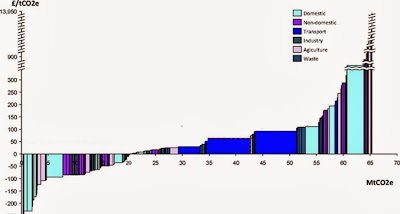 The basic use for the MACC is to read off what should be the cost of achieving a particular level of abatement: if we want X million tonnes, we read across from left to right until the cumulative widths of the bars hits X: then we read up the Y-axis to find out (a) the marginal abatement cost - i.e. the most we need to pay per unit to achieve our target, and (b), integrating under the curve to that point, the total cost involved. There is a truly obvious assumption being made here: you always do the cheapest things first. Right ? I mean, if there are lots of self-financing measures available, maybe overall we could meet a target and actually make money ! Wrong. The idiots at the helm throw money at measures that are way up the right-hand end of the curve, e.g. solar power in NW Europe. It's genuinely outrageous. Why they do this is an interesting topic in itself: but enough said for now. The point is, there is real scope for cutting out this nonsense, and what could be more easily defended than sticking to the left-hand end of the curve ? So - there you go, Dave: C@W points the way. Get cracking & do something useful. Is this just a UK-centric chart or does it take a global view? i.e. Does it take Kyoto mechanisms such as CDM and JI into account? Simple. Clear. Easily understood and politically expedient. Won't happen will it? One lives in hope, I guess. I've only limited blogging opportunity on holiday, so can I post my QT entry here and hope that somebody transfers it to the official post. Dimbletie - Green and yellow stripes. 1. Grangemouth refinery to close - is Cameron continuing Thatcher's war on the indsutrial North? 2. Getting rid of green taxes, freezing petrol duty to encourage more cars onto the road, nuclear subsidies, didn't Cameron say that this was going to be the "greenest government ever'? 3. That royal christening thing - was it kept deliberately low key for fear of triggering riots again like after major in your face royal displays of unearned wealth and power? 4. Jimmy Savile and compensation culture - is the rest of the UK finally catching up with Liverpool? 5. False widow spider - is this scare story to compensate us for that we didn't have any "super bug" scare stories over the summer? Is the NHS equipped to deal with the massive influx of bite vicitms? Apparently, its bite gives you headaches and nausea but is usually not fatal. So no more harmful than drinking booze, really. Subsidised insulation etc. should be a good call. It could be arranged by councils etc. on a street-by-street basis. This week it's Acacia Avenue and all the houses have cavity walls, undsoweiter. And of course ND you are totally right. Do the cheap stuff first! This is why cap and trade can work. Didn't someone pay Jamaicans to switch to energy-saving bulbs a few years ago? Maybe French goods would be more competitive on world markets if the Germans were paying the "true" price for their new lignite-fired electricity? But wait, all of this requires a sensible international regime which Clegg et al. seem to be dead against. Some of the free insulating has been done. I have cavity insulation (4 bed detached so not quite free, I think it was £80). I have gone to all LED light bulbs. I have a tiny amount of solar. I have a new condensing gas boiler. Result: My energy bills have gone up regardless. That's what puts people off, they save 20% and the bills go up buy 40% to compensate! Among the ironies is that the less you use the more you pay(average) per unit. I WANT a smart controller not meter. I want it to automagically turn on my washing machine when the juice is cheapest. We have an electric shower (8.75Kw) So I want a little text that says "Leccy at 3.2p/Kw available" - shower now!!! Same for hot water boosting I want it to turn on when the price reaches a low that I specify (when e.g. its cheaper than using the gas boiler) or similar. Given our computing power today, these things too should be low hanging fruit. The people lobbying those in power don't want us to SAVE money. They want us to SPEND money on THEM. Bought a new boiler 4 years ago. Took out the 20 year old one, thought we might save a bit long run. new one packed up last week. £900 to repair.